CHAMBERSBURG – The bylaws of the Franklin County Bar Association require us to evaluate the candidates running for Common Pleas Court Judge for the 39th Judicial District. Over the last few years, many members of the FCBA have dedicated substantial time and effort into revamping the process by which candidates are evaluated, including a vetting process conducted by the newly created Judicial Evaluation Committee. This provides for additional information regarding candidates previously not readily available for review by members prior to voting. Brink graduated from the Thomas M. Cooley Law School in 1999. Immediately following law school, he served as a law clerk for the Honorable Leopold Borrello of the Saginaw County Circuit Court. He worked in private practice in Michigan and as a staff attorney for the UAW-GM Legal Services Plan in Flint, Michigan. He joined the Franklin County Public Defender’s Office in November 2005 and worked there through March 2018, when he joined the Franklin County District Attorney’s Office. Brink has been part of the team working with the Good Wolf Treatment Court. Brink is a member of the Franklin County Bar Association, the Pennsylvania Bar Association, the Pennsylvania District Attorneys’ Association, the Public Defenders’ Association, and the Pennsylvania Association of Criminal Defense Lawyers. In the community, Brink is a member of the Kiwanis of Downtown Chambersburg and the Patriotic Order of Sons of America in Orrstown; he also coaches youth sports. References pointed to Brink’s fairness and his pragmatism. He is viewed as a creative problem solver. The members of the Judicial Evaluation Committee believe that Brink possesses the integrity and judicial temperament to serve as a judge on the Court of Common Pleas. Franklin County Bar Association has 151 voting members. 84 members of the Franklin County Bar Association voted; 75% agreed with this recommendation. Shank graduated from the Dickinson School of Law of The Pennsylvania State University in 2004. Following graduation, she worked in private practice in Chambersburg. Shank has represented municipalities in the role of Assistant Solicitor (Boroughs of Chambersburg and Waynesboro) and Solicitor (Franklin County and Waynesboro Planning Commission); she serves as Special Counsel to the Adams County Board of Assessment. Shank has been active in the community, currently serving as Vice Chair of the Keystone Rural Health Center and on the board of the Shook Home and Rehabilitation Center. She also served as a board member for the Cumberland Valley School of Music, the Foundation for Enhancing Communities, Downtown Chambersburg, Inc., and the Totem Pole Playhouse. Shank has served as President of the Franklin County Bar Association and as a member of the Franklin County Orphans’ Court Committee. By all accounts, Shank is a hard worker, who is always prepared and highly analytical. The members of the Judicial Evaluation Committee believe that Shank possesses the integrity and judicial temperament to serve as a judge on the Court of Common Pleas. Franklin County Bar Association has 151 voting members. 84 members of the Franklin County Bar Association voted; 89% agreed with this recommendation. During the evaluation process both candidates submitted questionnaires to the Committee with personal and professional information. These questionnaires are available for public viewing. 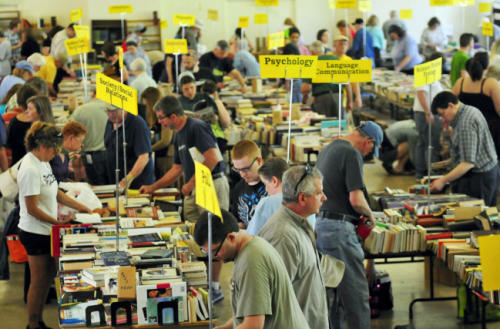 Donations of used and new books on all subjects, including paperbacks, are needed. We also welcome artwork, CDs, DVDs, sheet music, audio books (on CD), puzzles, and board games. Encyclopedias, textbooks, cassettes, and VHS tapes (except Disney) are not accepted. A special silent auction section will be reserved for artwork and rare books. Receipts for tax purposes are available upon request. For more information, please call Franklin County Legal Services, 717-262-2326. Donations are accepted from February 12 to April 15, 2019 at the following locations. Larger donations may coordinate delivery or pickup by calling 717-262-2326. Visit www.fcls.net for more info! Forest Myers was honored with the Edmund C. Wingerd Jr. Award during the annual Admissions Ceremony of the Franklin County Bar Association held on December 7, 2018. The Wingerd Award is bestowed upon a FCBA member who has shown commitment to community and the highest standards of professionalism and service to his or her private clients and the needs of the underprivileged. “Throughout his career, Forest has been an example for all of us to follow with his involvement in both the county and statewide bar associations, not to mention all of the committees and boards on which he has served. Forest actively champions to improve the practice of law and the legal profession, as well as increasing access to justice for all while encouraging others to do the same. Forest continues to engage attorneys of our bar association, particularly our Young Lawyers’ Division, to take an active role in our bar and our community. I truly believe that the description of the Wingerd Award depicts Forest and his career perfectly.” said FCBA President, Kristen Hamilton, who presented the award. Mr. Myers is a sole practitioner located in Shippensburg, focusing on real estate, title insurance, wills, trust and probate. He is a graduate of Penn State University and the Dickinson School of Law. He is a past president of both the Franklin County and Pennsylvania Bar Associations. Myers served from 2007 until 2010 on the PBA Board of Governors as the unit county bar association governor. He has been a PBA zone delegate since 2003 and has served on the PBA Alternative Dispute Resolution Committee and the PBA Client and Community Relations Committee. In addition, Myers is a long-time member of the PBA Unauthorized Practice of Law Committee. He is a former member of the PBA Professionalism Committee and the PBA Real Property Probate and Trust Section’s Estate Planning Committee. Mr. Myers was selected by the Supreme Court of Pennsylvania to serve on its Interest On Lawyers Trust Accounts (IOLTA) Board which oversees the interest earned on funds deposited to lawyer’s trust or escrow accounts. This board distributes over $13 million annually to legal service providers across Pennsylvania to enable them to provide legal services to our citizens who are not able to afford a lawyer. Active in his community, Myers was board president of the Shippensburg Area School District from 1983 to 1985. He is a former drive chair of the Shippensburg United Way. He also served as a member of the Shippensburg Park Commission. Forest is supported fully by his wife Becky, a very talented artist, in all of these endeavors and quite often accompanies him to events or hosts them at their home. Becky and Forest enjoy a love of travel, family and all things Penn State. The Franklin County Bar Association admitted 10 new members at its Admission Ceremony held on Friday, December 7, 2018. The new members admitted were Adam H. Fennen, of Weigle and Associates, P.C. ; Brittany R. Henderson, of Franklin County Legal Services; Brendan M. Sullivan, of Franklin County Legal Services; Laken D. Lynch, law clerk to Honorable Shawn D. Meyers; Justin M. George, of Salzmann Hughes, P.C. ; Brady Johnson IV, of Salzmann Hughes, P.C. ; Sarah K. Ikena, of the Franklin County Public Defender’s Office; Thomas E. Robins, of the Franklin County Public Defender’s Office; Enoch H. Jones, the Franklin County Public Defender’s Office; and Christopher J. Mosebrook, the Franklin County Public Defender’s Office. The ceremony, held in historic Courtroom One of the Franklin County Courthouse, included words of advice to the new admittees from the Honorable Carol L. Van Horn, Pennsylvania Bar Association President Charles Eppolito, Franklin County Bar Association President Kristen B. Hamilton and Young Lawyers Division Chair Brandon Copeland. Pictured l-r: Amber Chase; Nikki Sipe, YLD immediate past Chair; Brandon Copeland, YLD Chair; Krystal MacIntyre, YLD Community Outreach Chair; and Victoria Beard, YLD Vice Chair. The FCBA YLD hosted a handmade blanket drive from October 8th – December 7th, 2018. Over the 2 month period, our YLD collected blankets and made blankets from donated materials and kits. Our community outreach chair, Krystal MacIntyre, scheduled several crafting days, during which YLD members cut and tied material to make blankets over their lunch hour. YLD Chair, Brandon Copeland, promoted the blanket drive to our Bar members and Board of Directors. 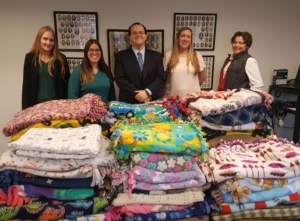 The FCBA YLD has donated 40 blankets to the Franklin County chapter of Project Linus. Thank you to our members who donated blankets and materials! 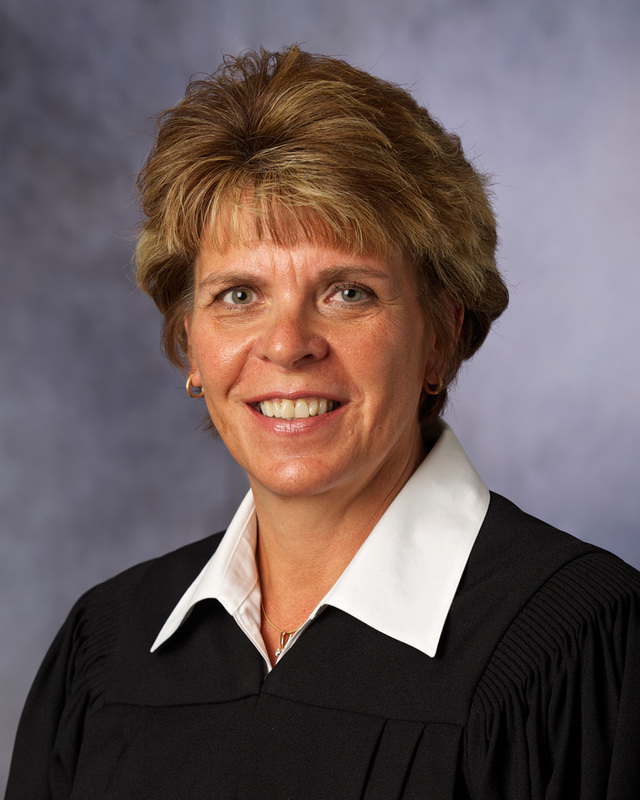 President Judge Van Horn has confirmed that she will not be seeking retention for a third ten-year term as Judge. President Judge Van Judge will continue to serve until the end of 2019. Judge Van Horn served as the 23rd FCBA president from 1999 until 2000. In 2010, Judge Van Horn was the 16th recipient of the Silvia H. Rambo Award in recognition of her exemplary contribution to the legal profession and society as a whole. 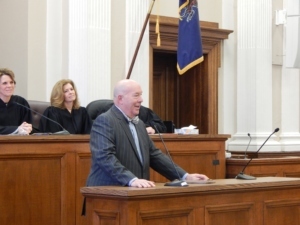 There are certainly not enough words to describe the countless contributions and accomplishments of Judge Van Horn to the practice of law, both as an attorney and a judge. The dedication and commitment she has shown to the residents of our counties and the betterment of the justice system is evident through her renowned and tireless work both locally and throughout the state. Judge Van Horn enjoyed a reputation as a fierce advocate for her clients as an attorney and continued that passion once she ascended to the bench. Judge Van Horn has been the constant champion of children’s rights through dependency, delinquency and family law work, and established herself as an esteemed criminal Court judge. Most recently Judge Van Horn along with District Attorney Matt Fogal, implemented Good Wolf Treatment Court to address the serious opioid and addiction crisis that our community is facing. Yet, despite all of these achievements, Judge Van Horn has never been one to be satisfied with mediocre, she never fails to push harder where she knows there is room for improvement; and somehow she inspires those around her to work towards the same. That is certainly a quality that cannot be taught. Although there have been rumors circulating through the bar association about Judge Van Horn not running for retention, now that it is official, it is certainly with mixed emotions we as the bar association take the news. As much as we would love to have her run for retention knowing the amazing things that she has done for our communities and justice system, we also understand that there are other things in her life that deserve her full attention and that Judge Van Horn has absolutely earned the right to enjoy. We certainly wish her the best in this new, and well-deserved, phase of her life. We cannot thank her enough for her service and her leadership.